I bought these espadrilles last summer and wore them all the time (so comfy) and I’m so excited it’s warm enough to finally wear them again! There’s a less expensive version here and here and I LOVE this new version that just came out, those scalloped edges are everything!! Love this outfit! It is simple yet so feminine! 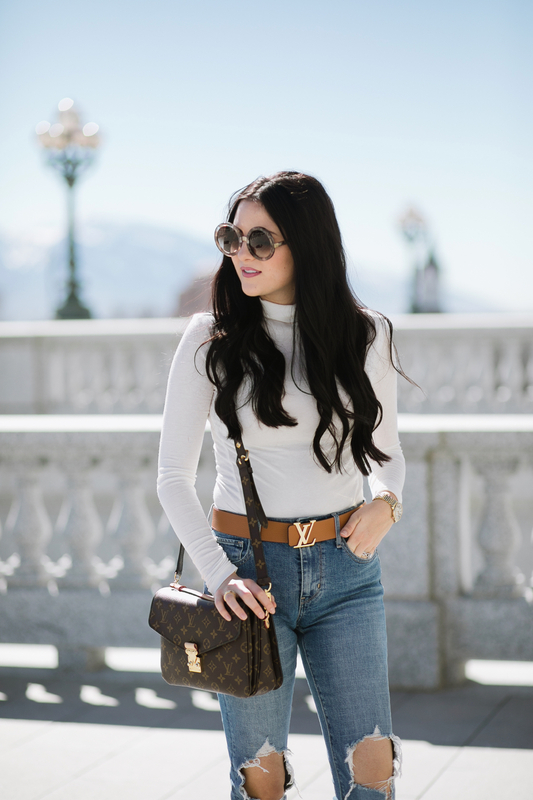 Is a turtleneck considered spring wear? I always thought of it as wintery. The shoes seem super comfortable and I love the jeans as well. Spot on casual combo! I like your sunnies and wedges very much! Beautiful woman! And I love and need these wedges!! This look is so simple and cute. This is such a cute outfit, Rach! 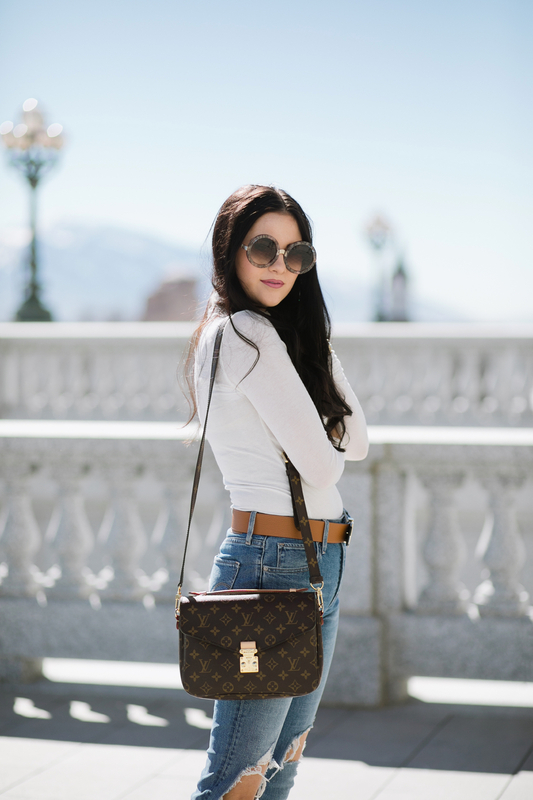 I love the pops of cognac with both the belt and those super cute espadrilles! I tend to gravitate towards these shades of brown this time of year, too! Thanks for sharing and I hope you’re having a lovely day so far! Love this look—so simple but put together! Great espadrilles, and your sunglasses are so fun! Stunning as always!!! I love this chic look! I also love that you give examples of additional brands that can sometimes be more affordable. :) Thank you! I hope you’re enjoying Spring with your beautiful family!! Have a wonderful day! Thanks for stopping by Terrell!! I hope you have a wonderful Tuesday! Love those jeans! And I have the Marc Fisher version of those wedges and they are perfect for spring! They really are!! I love the Marc Fisher ones! Your sunnies are TDF and I love this entire look! 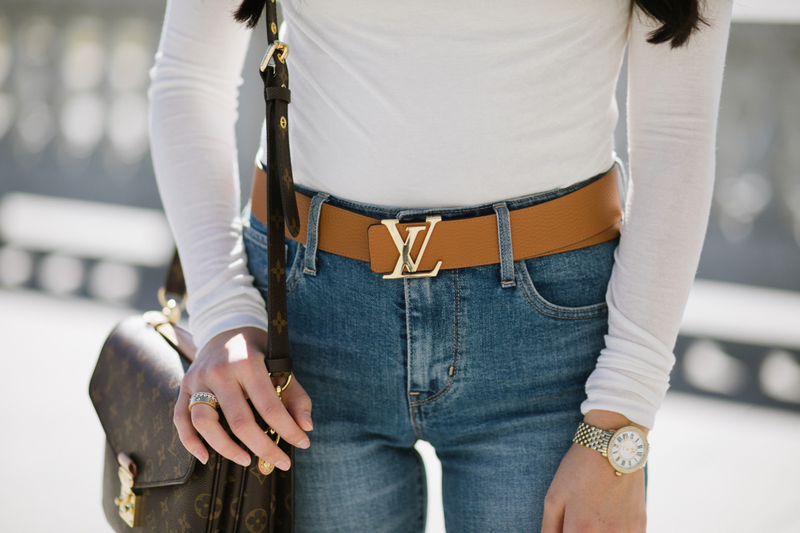 This LV belt <3 omg ! Thanks August!!! I know, I’m obsessed! You are so chic! I love these wedges!! Those MiuMiu sunnies are my absolute favorite!! Love the belts you’ve been wearing lately! Thanks Reece!! It’s a trend I’m really embracing lately! Love this! It’s a basic outfit, but the pieces are anything but! 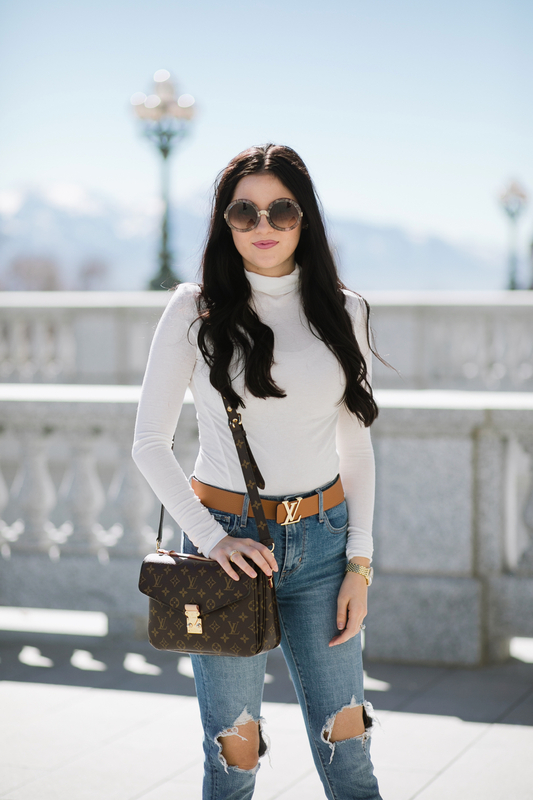 A similar combo will definitely be my go-to this spring! That belt has got me head over heels! LOVE this look. So classic! Love those jeans! Those sunnies are fab too! I love those jeans and shoes paired together! Thanks for stopping by, Paige!! Those ripped jeans are amazing, love how you styled them!